A portable lap-top workstation, n, designed to provide ergonomic conditions while keying. 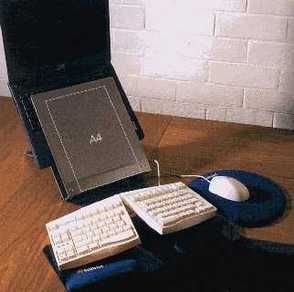 The device raises the screen and is used with an external keyboard and mouse. When opened, the front becomes an A 4 sized document holder, which is situated between the monitor and keyboard. There are 5 positions for height and angle adjustment. The device folds into a light, flat and easily transportable plastic envelope.
. Designed to hold the laptop with the monitor at eye level.
. Documents are supported by a retractable 25mm ledge.
. Lap top keyboard slides between the document holder and the slip resistant material on the back support. 1. Open the laptop station and place the circle in one of the 5 sleeves to adjust the height (5 posible options). 2. Pull the front panel towards you, check if the laptop station is standing correctly, and place the laptop in the holder. 3. Plug in your mouse and external keyboard (if required with PS/2 splitcable). Model Ergo Q Laptop Station: Available in Different Features.